I was born and raised in a rural area of Western Kentucky. We moved to a new house in 1971, when I was 4 years old. Lush green grazing pastures with cattle, tobacco patches, and corn fields were plentiful but neighbors were non-existent and I had no other children to play with. I was the youngest in my family and not old enough to go to school. I remember it like it was yesterday, we had just moved to the house only a few weeks before. It was the middle of the day and I was sitting in my chair at the kitchen table. Dad should have been at work, but instead, he walked by the kitchen window carrying a brown box that contained my first puppy, a beagle/ rat terrier mix. This pup was black, with a little tan and he had a white tip on his tail, a white spot on his chest and he reminded me of my favorite cartoon character: Pepe-Le-Pew. With a little help from my older sister, I named him Peppy. trampsing in the yard for hours with Peppy and at times on her front porch furniture curled up with Peppy, both of us napping. 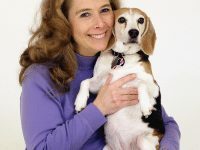 My career with dogs has been a life-long quest and it all began when I was 4 years old. At that tender age of 4, I told my Dad, I was going to work with dogs some day when I grew up. I think my Dad thought he was getting me a playmate with this first puppy. Little did my parents know what they thought was a passing fad of a small child, was a growing immense passion for the art and science of dogs, dog training, and dog behavior. I began training my dog to do great things at that young age, and by the age of five and a half it got me into much trouble. I had taught Peppy to do things my parents did not approve of. He did them quite well, on cue, and with precision. When I learned to read in the first grade, the only books my parents could get me to read from then on were books and articles about dogs and horses with the occasional exception of an Encyclopedia Brown book here and there. Dogs have been a very important part of my life ever since. Little did my Dad know what that day would mean when he had brought home his little girl’s first puppy as a gift. That brown box with that little puppy had the start of my career path.